The Summer edition of ESTA’s Protocol is now live online! What's New > The Summer edition of ESTA’s Protocol is now live online! Take a look online at: http://estalink.us/protocolonline. Learn more about Protocol at http://esta.org/Protocol/protocol.html. 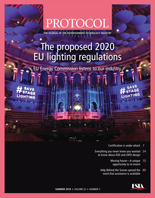 Rob Halliday updates readers on #SaveStageLighting and the EU’s Ecodesign regulations. Geiger Engineers’ Miriam Paschetto discusses two common design methods: Allowable Stress Design and Load and Resistance Factor Design. Jason Potterf writes about “Network Advertisement of Entertainment Protocols” to ease infrastructure setup. Kent Jorgensen outlines developing a fallen worker rescue plan. Relocating your business? Harry Box interviews a cross section of industry companies that have moved—learn their tips for success and pitfalls to avoid! “Shadow, Light, and Truth” column by Richard Cadena explores inspection and maintenance of electrical apparatus. Guy Holt continues his series on solving generator-related LED luminaire power quality challenges. Lex Products’ Patrick O’Keefe and John Valus review load diversity in multi-conductor cable assemblies and examine their inherent limits. Eddie Raymond’s past two “Take Away” columns on harassment and abuse within the industry resonated with readers. Eddie continues with the women of ETCP speaking out on this timely and critical topic. 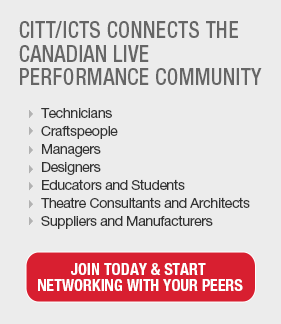 This issue’s CITT/ICTS News column, written by Ed Mantler, Vice President, Program and Priorities, Mental Health Commission of Canada, focuses on mental health in the entertainment technology workplace. The ETCP News column, written by Andrew Boucher, addresses “ETCP: The beginning, not the end.” Don’t miss his thoughtful perspective. Didn’t make it to Prolight + Sound 2018 or the BTT Dresden expo? Read the highlights of what you missed. ESTA’s President Jules Lauve outlines “Certification is under attack!”—and what you need to look for if this becomes an issue in your state—then notify the ESTA office. The Technical Standards Program has produced more than 50 ANSI-approved standards—with more in the pipeline! Read the update in TSP News from Karl Ruling. Production Equipment Rental Group News by Harry Box updates readers on PERG’s productive first half of 2018. Behind the Scenes News asks readers to spread the word that assistance is available! Plus, learn about the 15th Long Reach Long Riders’ charity ride and the Short Reach Short Riders’ fundraiser for BTS. ESTA Remembers John S. Hyatt. Protocol is now available as a free app for your smartphone; whether you have an iPhone, iPad, or any Android device, you can now read the latest editions whenever you want and wherever you are. Visit http://estalink.us/protocolapp, click on the corresponding device in this text or search “Protocol Journal” in the iTunes App Store / Google Play Store. Let us know what you think! We hope you enjoy your new edition of Protocol and, as always, we would appreciate any feedback and suggestions that you can email to beverly.inglesby@esta.org. Like us on Facebook https://www.facebook.com/ProtocolMag to receive ongoing updates in between issues. Please let us know how we can assist you with your advertising plans for the last half of 2018—contact Beverly Inglesby or Jackie Tien and we will work with you to fit your marketing needs.